Hitachi's Finger Vein ID could replace fingerprints as most secure ID! Companies in Europe have begun to roll out VeinID, an advanced biometric system from Japan that identifies people from the unique patterns of veins inside their fingers. 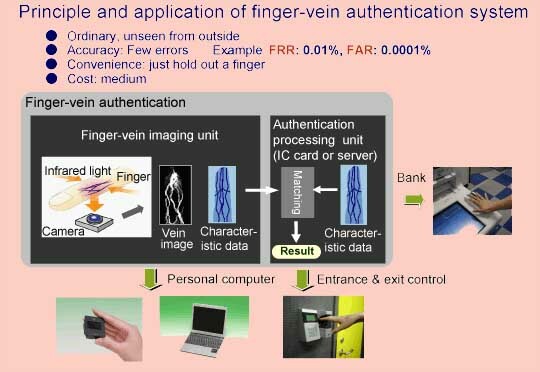 Finger vein authentication, introduced widely by Japanese banks in the last two years, is claimed to be the fastest and most secure biometric method. Developed by Hitachi, it verifies a person's identity based on the lattice work of minute blood vessels under the skin. Easydentic Group, a European leader in the biometric industry based in France, has announced that it will be using Hitachi's finger vein security in a range of door access systems for the UK and European markets. In Japan, thousands of cash machines are operated by finger vein technology. Hitachi announced today that it will introduce 20,000 finger vein authentication systems at shops and kiosks belonging to two Japanese companies, which will use the devices to protect the privacy of customer information by requiring storeworkers to authenticate themselves before accessing the customer database. 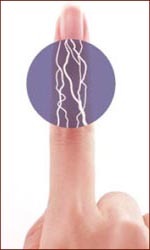 The pattern of blood vessels is captured by transmitting near-infrared light at different angles through the finger, usually the middle finger. This can be done in a small instrument attached to a wall or as part of an ATM machine. The light is partially absorbed by haemoglobin in the veins and the pattern is captured by a camera as a unique 3D finger vein profile. This is turned into a simple digital code which is then matched with a pre-registered profile to verify an individual's identity. 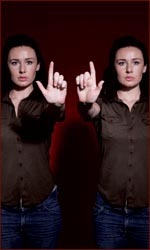 Even twins are said to have different finger vein patterns. Hitachi claims that because the veins are inside the body, invisible to the eye, it is extremely difficult to forge and impossible to manipulate. While fingerprints can be "lifted" and retinas scanned without an individual realising it, it is extremely unlikely that people's finger vein profiles can be taken without them being aware of it, the company says. The gruesome possibility that criminals may hack off a finger has already been discounted by Hitachi's scientists. Asked if authentication could be "forged" with a severed finger, the company says: "As blood would flow out of a disconnected finger, authentication would no longer be possible." Hitachi says finger vein authentication is less expensive than iris scanning or face/voice recognition and that the false rejection rate is much lower than with fingerprinting. And people don't have to remember a pin number. Hitachi's system is being used to verify user identities for ATMs, door access systems and computer log-in systems in Japan. An alternative technique, developed by Fujitsu, scans the palms of people's hands to identify a similarly unique vein pattern. This system has also been gaining international recognition. It was recently installed at Carolinas HealthCare System, based in Charlotte, North Carolina, the first healthcare provider in the United States to implement this technology. The palm scanners, which are linked to hospitals' patient registration databases, are used at admitting, the emergency department, one-day surgery, and all inpatient and outpatient registration points. "Most recently, we have begun a rollout to physician practice settings for our physicians network," said Steve Burr, vice president of patient financial services.